Maybe you’ve seen the TV commercials, or gotten a plaintive plea from a public school parent you know: Kohl’s is giving away $500,000 to each of the 20 schools that get the most votes! Vote for your school today! When a friend of mine asked me to vote for her kids’ school, of course I went right to Facebook to comply. Easy, right? All you have to do is click. But I was pretty turned off when I saw that I had to provide the Kohl’s Cares Facebook application with my right arm, my firstborn child and a few golden coins in order to vote. Well, I’m exaggerating, but only just a little — in today’s digital economy, personal data, freely given, is worth a pretty penny. Kohl’s Cares asked me to authorize it to receive information about my friends, my likes, my dislikes, and any other information stored about me on Facebook’s servers (which, as we all now know, is quite a lot). I had to stop and think for a while, to balance my sincere desire to get public schools any and every penny I can with my desire to keep some information safe from the digital maw of Facebook and its corporate partners. Reader, I clicked. I gave Kohl’s what it wanted because I wanted to fund not only my friend’s school, which is populated with many wired parents and students and has already received more than 700 votes, but also another school that has lots of heart but few wired parents and supporters. (While I was at it, I voted for my own daughter’s school, because — why not? The horse had already left the barn). 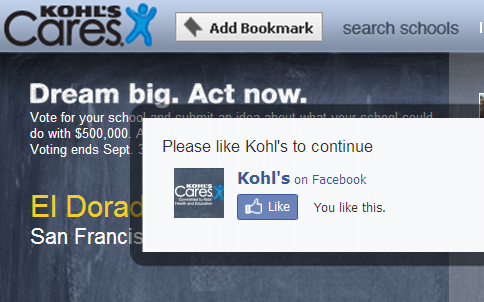 I even clicked again, when Kohl’s told me I had to “Like” it in order to register my votes. What’s wrong with this picture? Is this what parents and teachers are reduced to in order to fund schools? Selling out to corporate interests? Kohl’s is investing $10 million, not including the cost of launching the TV/Facebook campaign — they’re not just getting good will out of it. Of course I’m grateful for companies like Kohl’s and Target that are trying to provide a cost-effective funding stream for education. But what corporate citizens and individual citizens should be doing is figuring out how we sustainably fund a high-quality educational system across the country, a system that doesn’t depend on having networks of wired parents, grandparents and other boosters in order to win. Why should Kohl’s, a department store chain, be interested in education funding? Because, in a tough economy, appealing to consumers’ support for education brings out the donors and the positive karma that leads to sales. The moral of this story is that we should just fund our schools without resorting to commercial contortions like that of Kohl’s Cares. Not only is our current system of education funding not working, it’s creating a perverse incentive for companies to exploit the anxieties of parents and other people who worry that our schools are failing. Click here, give us your data, and we’ll give a few schools a significant sum (pennies for us, big bucks for you). If you can’t beat ’em, join ’em. I am trying my hand at a viral Facebook campaign, by creating a group called “I Sold Out to Fund Schools with Kohl’s Cares.” Do you think there’s a better way to fund schools than selling out to corporate interests? Join the group. Did you sell out to vote for your school or a friend/co-worker/family member’s school? Join the group to let your Facebook friends know you don’t actually “Like” Kohl’s (I’m sure it’s a perfectly nice chain of stores). yes, any group you like or join pulls info from your page or gives the group access to your page. I have a business page and I can see everyone who likes and their info, as well as their FB page. What I find an even bigger turn off is not what Kohl’s is doing but what the top schools on the leader board are doing to win this. One rather affluent school is raffling off 8 ipads in 8 weeks if you vote for them. Each vote is entered in a raffle. Let’s so the math 8 ipad minimum are $500 each. So $4000. Look at the lender board and notice 15 of the 20 top schools are private jewish schools with tuition of 10k and upward per year. Also take note that the majority of others also on the leader board are private catholic or christian. There is one public school in the lead Lake High School. Their school was flatten by a tornado. They deserve to win. The others are buying their votes. Now that is sickening. Guess the rich just keep getting richer and the rest of us are running on a wheel trying to get in the race. They same schools win these contest over and over because they have money to by prizes to offer for your vote. Kohl’s should band that type of activity and not allow schools who do that to win. Thanks for the great post. I grew up in CA and remember that before Prop 13 schools didn’t have to do back flips for the basic resources they needed to provide quality programs. I remember full-time school nurses and librarians, and counselors with manageable student ratios. I remember taking summer school classes for enrichment and … fun! Unfortunately, begging for resources seems now seems to be the norm. Your article made me think of the psychological experiments I read about in college where chickens were given a food pellet as a reward for pecking at a button. Scientists found that after the chickens learned the button pecking behavior, they could give food less and less often, because the chickens kept pecking to get the intermittent reward. Thanks for reminding me than pecking, or clicking in this case, for small rewards isn’t going to get us anywhere. We need to focus our time on creating a real solutions for funding our schools. Fixing prop 13 would be a great step in that direction. @Jaquelyn – really? My FB fan page asks for data? I guess FB must collect that on all fan pages; someone else set it up for me. Similarly, I should start a facebook group called something like “I Just Can’t Quit Donors’ Choose, but I’m Sure Not Pledging to See Waiting for Superman”. Thanks for the nice article, Rachel. I think that corporations are getting too involved in our public school system. But, I realize that funding schools is a very complicated and divisive issue.